I am fascinated by the airport. For so many reasons. After a work trip in 2013, when I livetweeted what was happening around me at the gate while waiting to board, #airportliving was born. 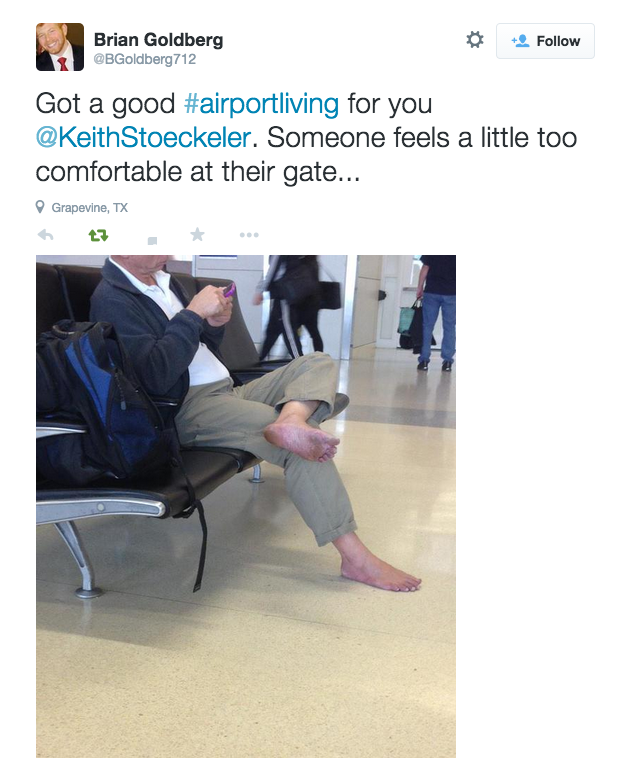 I may not have been the first to tweet it, but I've been the Ambassador of #airportliving since. I encourage the use of #airportliving in your airport-related tweets, and if I see a tweet that fits but doesn't contain the hashtag, I'll retweet you with the hashtag included. Basically, I find the airport (and airplanes) to be a zoo. The airport is quite a primal place. We often nap in the airport and sometimes sleep overnight, we see no issues with sitting on the floor in order to be closer to our devices charging, and we essentially have no regard for public space or others being around us. We complain about a lot when in the airport, especially how things aren't going our way, the high price of items, or how long we have been waiting. People display some truly bad habits at the airport. It was tweeted as part of a CBS News story, and I've also seen some #aiportliving advertising (1, 2).